Momochi is the name a coastal area facing the Bay of Hakata, where in 1989 it was held a big fair known as 1989 Asia-Pacific Expo (Yokatopia), and today primarily an area for relaxation and recreation. All places of interest are located more or less in front of a long artificial beach (about 1.5 km long considering also the beach beyond the river), known as Momochihama, a very popular place to walk, especially for couples, where to see a romantic sunset. On summer days the beach is also full of people relaxing, practicing various beach sports, water sports, or simply taking a swim though the water is not exactly spotless. 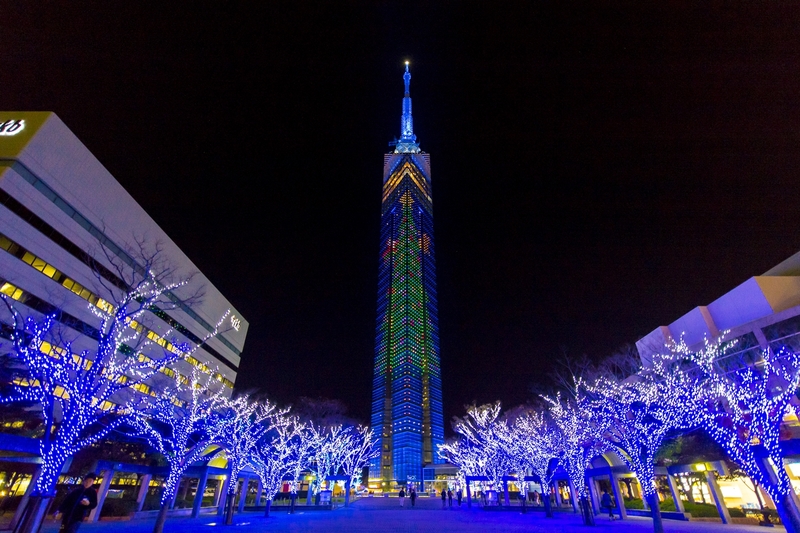 The tallest building in the city, a 234 meters high tower built in 1989 to commemorate the 100th anniversary of the founding of Fukuoka city. It is also the tallest skyscraper located in front of the sea of Japan. It is located virtually opposite Momochihama beach. Featuring an interesting exterior architecture, whose surface is covered with 8000 mirrors, the tower is a popular tourist destination especially for the observation deck on three floors located between a height of 116 and 123 meters, from where you can enjoy wonderful views, not just at night as in many other observatories, but also during the day because of the stunning sea in front of you. In one of the three floors there is also a cafe serving hot and cold drinks, pastries, pizza and spaghetti. 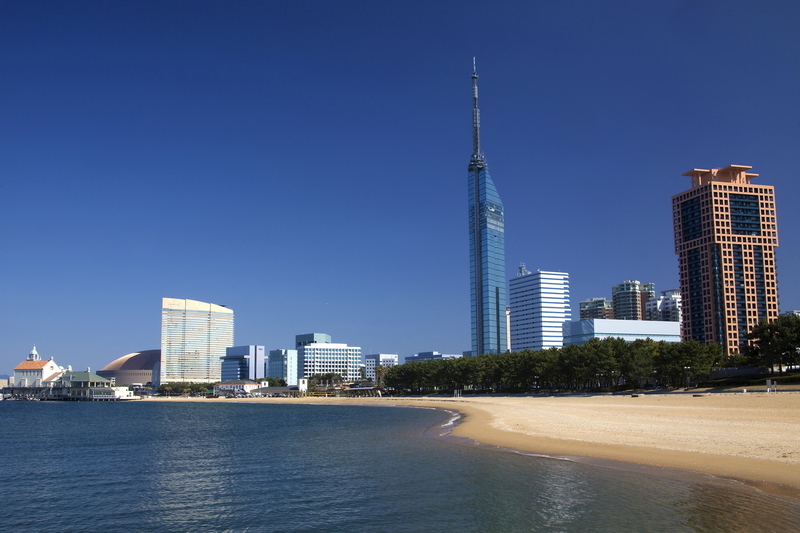 A shopping complex located right in the middle of Momochihama beach, and right in front of the Fukuoka Tower. The buildings on the beach house some shops, cafes and restaurants. The complex also includes a small artificial island on the sea with a few strange buildings including something looking like a church. That is not a real church but a luxury complex for weddings, and the false church is part of the scenery. This island is also the departure point for some boats bound for Uminonakamichi (Uminaka line) and other tourist boats going around the Hakata Bay. Located about 500 meters from the beach, this museum is dedicated to the history of the city of Fukuoka, from ancient times to contemporary Fukuoka. Another part of the museum hosts temporary art exhibitions changing every 2 months and whose admission is separate, the calendar can be found at this link. This place is on the second floor of a skyscraper located just behind the Fukuoka Tower, that is the TV Nishinippon building. 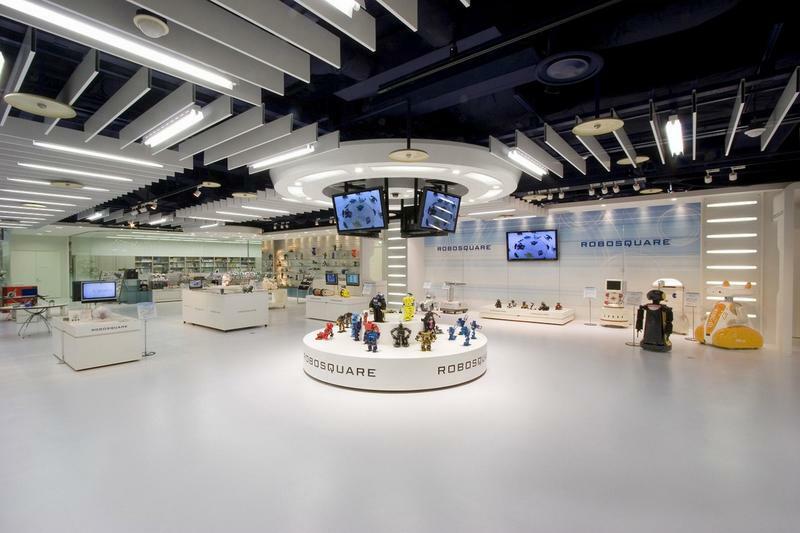 It is a showroom dedicated to robots, with about 200 different models on display, as well as some real research labs and a shop. The showroom is mainly aimed at children, but also adults could find it interesting. It was opened in 2002, because the city hosted the year's edition of the Robocup, a football competition between robots created to support research in this field and with the aim of forming a team of robots that can beat a real football team by 2050. A complex that includes the stadium Fukuoka Yahuoku! Dome, the luxury hotel Hilton Fukuoka Seahawk, a concert hall (Zepp Fukuoka, at this link the calendar of upcoming events), and until not long ago also a large shopping center, known as Hawks Town Mall, now closed permanently. A modern multi-purpose stadium of nearly 40,000 seats, opened in 1993. 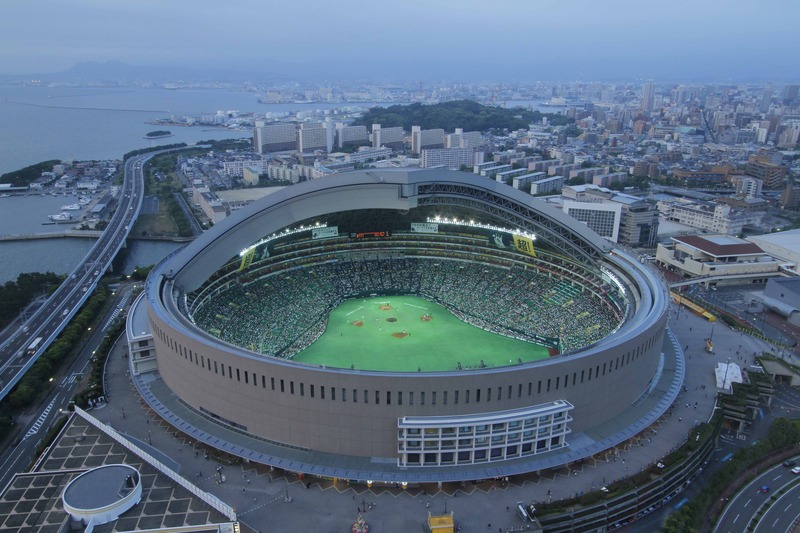 It is used mostly for the home matches of Fukuoka baseball team, the Fukuoka SoftBank Hawks, one of the 12 participating teams in the top division of the Japanese league and the only of the entire Kyushu region. The stadium is also often used to host concerts of great importance, many world famous singers have performed there over the years, for example Michael Jackson, Madonna, Frank Sinatra, the Rolling Stones. Inside the stadium there's also the Oh Sadaharu Baseball Museum (admission 1000 yen), a baseball museum mainly dedicated to Oh Sadaharu, a famous Taiwanese player holding the world lifetime home run record and other NBP batting records. 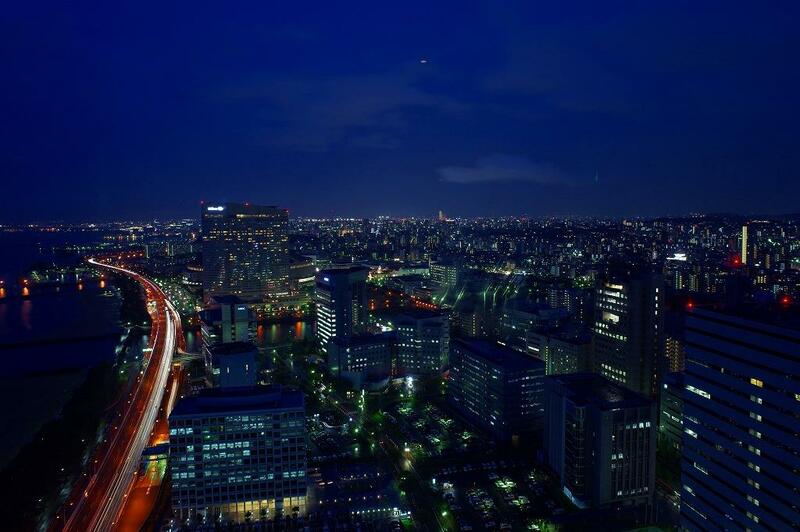 It is not an area where to stay during your trip to Fukuoka, both because distant from the rest of the city and because there are no hotels. The only hotel in the area is the luxurious Hilton described below, a great choice for a romantic night with stunning views from the room, or if you're going to see a concert or sports event at the stadium nearby. 5 star deluxe hotel of the famous hotel chain Hilton, located in a skyscraper next to the famous stadium and in front of Momochi Beach. The hotel standard is of utmost excellence. 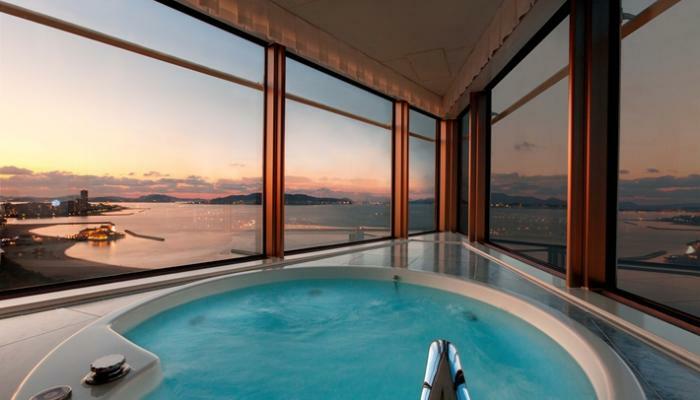 In particular we recommend some rooms with panoramic bath (in the picture on the left). Within the building also large public baths, an outdoor pool, a spa and 5 restaurants. In the low season you could find double rooms starting at about 18,000 yen per night, a really good price considering the level of this hotel. The closest subway station to Momochi Beach and the various attractions listed in this page is Nishijin station (Kūkō Line), located about 1.8 km from the beach. For the area of the Fukuoka Yahuoku! Dome it is better the previous station along the same line, Tōjinmachi Station. Alternatively, there are also a few public bus lines stopping just a short walk from the stadium or Fukuoka Tower, both from Tenjin and Hakata station, for example, lines n° #300, #301, #303, and others..
Lastly, Momochi Beach (near the Maruzen) is also a stop of the boats of the Uminaka Line (Official website in Japanese) bound for Uminonakamichi.